INTRODUCTION: Hydrophilic matrices containing swellable polymers are referred to as hydrogel matrices, swellable sustained release system or hydrophilic matrix tablets. A number of polymers have been investigated to develop in situ gel forming systems due to ability of these hydrogels to release an entrapped drug in aqueous medium and to regulate the release of such drug by control of swelling and cross linking 1. Hydroxy Propyl Methyl Cellulose (HPMC) 5 is the polymer most widely used as the gel forming agent in the formulation of sustained release dosage form. Water penetration, polymer swelling, drug dissolution, drug diffusion and matrix erosion from these dosage form are controlled by the hydration of HPMC which forms a gel barrier through which the drug diffuses 3, 10. The adjustment of the polymer concentration, the viscosity grade and the addition of different types and levels of excipientes 7, 8, 9. The HPMC matrix can modify the drug release rate. Tramadol is used in the treatment of osteoarthritis when nonsteroidal antiinflamatory drug (NSAIDS), acetaminophen, or COX-2 inhibitors alone produce inadequate pain relief. After oral administration, Tramadol is rapidly and almost completely absorbed. Sustained release tablets reach to peak concentration after 4.9 hours and have a bioavailability of 87%-95%. The mean elimination half life is approximately 6 to 8 hours and requires dosing every 6 hours in order to maintain optimal relief of chronic pain. As a result an attempt made to formulate once daily extended release tablets. Long term treatment with sustained release Tramadol HCl is generally safe in patients with osteoarthritis or refractory low back pain and is well tolerated. It has the potential to provide patients more control over the management of their pain, fewer interruptions in sleep and improved compliance. Materials: Tramadol Hydrochloride from ACI Pharmaceuticals Ltd. Bangladesh, Hydroxy Propyl Methyl cellulose K15M, Lactose, Microcrystalline cellulose (Avicel pH 101), Magnesium Stearate, and Talc was obtained from Dhaka University laboratory 12. Preparation of Matrix Tablet: Drug, polymer and other excipients 1 were weighed separately for each tablet per formulation according to proposed formulations shown in Table 3. The proposed formulations were coded as F-1, F-2, F-3, F-4 and F-5. All the amounts of drug and excipients are in milligram unit. Then Active ingredient (Tramadol HCl), polymer (HPMC K15M), and excipients (Avicel, lactose) were blended for 15 minutes and then Magnesium Stearate was added and was blended for another 1 minute. Blended mass was taken in the hopper and then die and punch were adjusted to get the desired weight of the tablet (200 mg). After Direct compression 13 the tablets were weighed and tablet weight was found between 198 mg to 202 mg 18. Bulk density: The bulk density of a powder is dependent on particle packing and changes as the powder consolidates. A consolidated powder is likely to have a greater arch strength than a less consolidated one and may therefore be more resistant to powder flow. The ease with which a powder consolidates can be used as an indirect method for quantifying powder flow. LBD (Loose Bulk Density) and TBD (Tapped Bulk Density) were determined by 2g of powder from each formula, previously lightly shaken to break any agglomerates formed, was placed into a 10 ml measuring cylinder. After the initial volume was observed, the cylinder was allowed to fall under its own weight onto a hard surface from the height of 2.5 cm at 2 second intervals. The reading of tapping was continued until no further change in volume was noted. Using the following equation LBD and TBD was calculating 4 . Where, h= Height of the powder cone; r= Radius of the powder cone. Drug content: An accurately weighed amount of powdered Tramadol HCl (200 mg) was extracted with diluents and the solution was filtered through 0.45 μ membrane filter paper. The absorbance was measured at 271 nm after suitable dilution. Flow properties: It is very important parameter to be measured since it affects the mass of uniformity of the dose. It is usually predicted from Hausner ratio and angle of repose measurement. Hardness and Friability: For each formulation, the hardness and friability of 6 tablets were determined using the Monsanto harness tester and the Roche friabilator respectively. Thickness: The thickness of the tablet was determined using a thickness gauge. Five tablets from each batch were used, and average values were calculated. Weight variation test: To study weight variation, 20 tablets from each formulation were weighed using an Electronic balance and the test was performed according to the official method. Drug content (Drug potency): Five tablets were weighed individually, and the drug was extracted with diluents. The solution was filtered through 0.45-μ membrane filter paper. The absorbance was measured at 271 nm after suitable dilution. Preparation of Calibration curve: Calibration curve for the estimation of Tramadol HCl content in the dissolution medium: To prepare a standard solution, 20 mg of Tramadol HCl was measured in an analytical balance (sartorius, Germany) and dissolved in 1000 ml Distilled water to produce a solution of 20 µg / ml. 1,2,3,4,5,6,7,8 and 9 ml of this solution was taken in test tube and 9,8,7,6,5,4,3,2 and 1 ml water was added to them respectively for the purpose of serial dilution. 10 ml of standard solution is also taken in a volumetric flask. The solutions were mixed well using vortex mixer. These serial dilutions allowed Tramadol HCl concentration to be made in the range of 2 µg / ml to 20 µg / ml. Then absorbance of the solutions was measured at 271 nm using UV spectrophotometer. A plot was constructed showing concentration at X- axis and absorbance at Y- axis. In vitro Dissolution Study of the Tablet Matrix: Dissolution studies were conducted according to USP method (USP XXII) 17 using apparatus II paddle at a speed of 100 rpm and the temperature was maintained at 37.0±0.5o C. The USP paddle system consisted of six glass vessels. These vessels contained the dissolution medium. The total duration of dissolution was 8 hours in which the tablet matrices were subjected to gastric media (0.1 N HCl pH 1.5) for 2 hours and the later hours the tablet matrices were subjected to intestinal media (Buffer pH 6.8) 14, 15, 16 . Acid stage: 900 ml of 0.1 N HCl was placed in each vessel and the apparatus was assembled. Six tablets from one formulation were weighed and placed in the baskets. The operation in the acid stage was carried out for 2 hours. After each hour 5 ml of sample solution was withdrawn and same volume of fresh medium was replaced. The released drug was assayed by using UV spectrophotometer at 271 nm. Percentage of drug release was calculated using an equation obtained from the standard curve 11. Buffer Stage: 900 ml of intestinal buffer media was placed in each vessel and the apparatus was assembled. Six tablets from each formulation were weighed and placed in the baskets. The operation in the acid stage was carried out for 6 hours. After each hour 5 ml of sample solution was withdrawn and same volume of fresh medium was replaced. The released drug was assayed by using UV spectrophotometer at 271 nm. Percentage of drug release was calculated using an equation obtained from the standard curve. 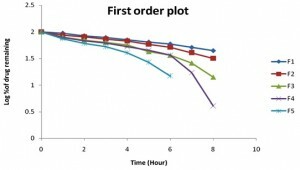 Kinetic Study: Further to understand the order and mechanism of drug release the data was subjected to various kinetic equations and plotted according to zero order, Higuchi, Korsymere’s Peppas and Hixson-Crowell. The kinetic values obtained from different plots are listed in table 7. F-1: After dissolution of tablets the percent release of drug after 8 hour was 55.44%. F-2: After dissolution of tablets the percent release of drug after 8 hour was 68.18%. F-3: After dissolution of tablets the percent release of drug after 8 hour was 85.87%. F-4: After dissolution of tablets the percent release of drug after 8 hour was 95.94%. F-5: After dissolution of tablets the percent release of drug after 8 hour was 100%. The aforementioned dissolution study indicates that with the decrease of drug to polymer ratio; increase the percent of release of drug. 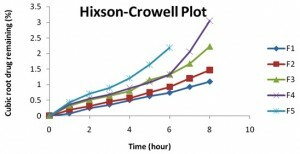 DISCUSION: After dissolution study the drug release patterns were simulated in different kinetic orders such as Zero Order release kinetics (figure 1), First Order release kinetics (figure 2), Higuchi release kinetics 6 (figure 3), Korsmeyer-Peppas release kinetics (figure 4) and Hixson-Crowell release kinetics (figure 5) to assess the release mechanism. F-1: In this formulation Tramadol HCl and HPMC K15M ratio is 5:6. Best fitted model for this formulation was First order (R2=0.992) and Hixson-Crowell (R2=0.994) model. F-2: In this formulation Tramadol HCl and HPMC K15M ratio is 5:5. 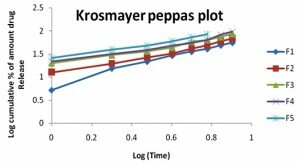 Best fitted model for this formulation were zero order (R2=0.994) and Korsmeyer-Peppas (R2=0.986) model. F-3: In this formulation Tramadol HCl and HPMC K15M ratio is 5:4. Best fitted model for this formulation were zero order (R2=0.986). F-4: In this formulation Tramadol HCl and HPMC K15M ratio is 5:3. 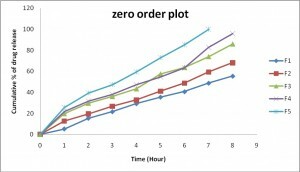 Best fitted model for this formulation were zero order (R2=0.975) model. F-5: In this formulation Tramadol HCl and HPMC K15M ratio is 5:2. 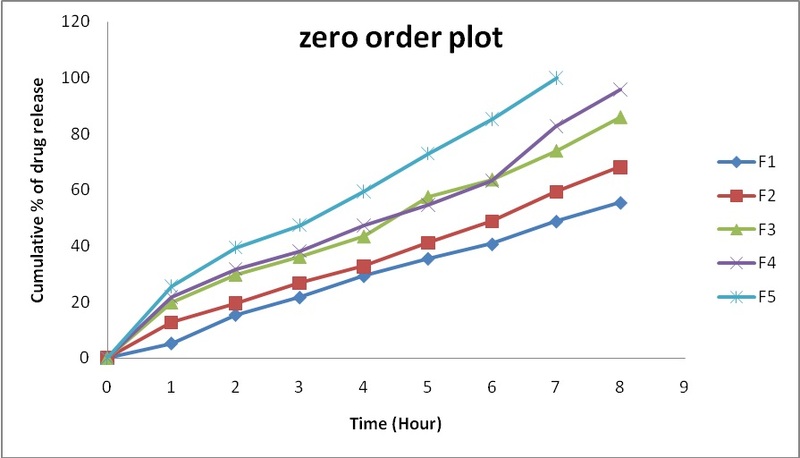 Best fitted model for this formulation were zero order (R2=0.984) and Korsmeyer-Peppas (R2=0.987) model. From the study, we observed that Zero Order release kinetics was the predominant release mechanism than Higuchi and First Order kinetics. Among the formulations of F-1 to F-5, a different amount of HPMC K15M polymer can sustain the Release of Tramadol HCl 55.5% to 100% in eight hour. CONCLUSION: The half life of Tramadol HCl is 5.5-7 hour for oral dosage. Due to short half life (5.5-7hr) and its higher water solubility make this drug a suitable candidate for sustained release dosage forms. From this study it was concluded that HPMC K15M CR met the desired sustained release properties. We also observed that zero order release kinetics was the predominant release kinetics among Higuchi, Korsmeyer-Peppas, Hixson-Crowell, Zero Order, and First Order release kinetics. Direct compression method may be appropriate for higher productivity, performance, and as results it saves valuable time in manufacturing time, reduce involvement of labor, reduce cost and increase profit. The proposed formulations may be used for the development of Tramadol HCl release matrix to meet the patient’s demand in order to combat against pain more precisely. Arthur H.K. Handbook of Pharmaceutical Excipients. 3rd Edition. Aulton M.E., Abdul-Razzak M.H., and HoganJE. The mechanical properties of Hydroxypropyl methyl cellulose films derived from aqueous systems Part I. Aulton, ME., Pharmaceutics: The science of dosage form design 1981; 191-211. Batycky R.P., Hanes, J. Langer, R. and EdwardrsD.A. A theoretical model of erosion and macromolecular drug release from biodegrading microspheres. J Pham Sci 1997; 89: 1464-77. Capan Y. Influence of technological factors on formulation of sustained release tablet. Drug development and industrial pharmacy 1989; 15: 927-95. Dow Chemical Company, Formulation for con-trolled release with METHOCEL cellulose ethers, USA 1987. Higuchi T mechanism of sustained action medication. Theoretical analysis of rate of release of solid drugs dispersed in solid matrices. J. Pharm. Sciences 1963;52:1145-1149. Langer R. and Folkman J. Polymers for sustained release of proteins & other macromolecules. Nature 1976; 263:797-800. Lee B.J. Ryu S.G. and Cui J.H. Formulation and release characteristics of hydroxypropyl methylcellulose matrix tablet containing melatonin. Drug Dev Ind Pharm, 1999;22:493-501. Longer, M.A. and Robinson, J.R. Sustained Release Drug Delivery System of Remington's Pharmaceutical Science 1990;18:1676-1690. Peppas N.A. Sahlin J.J. Hydrogels as mucoadhesive and bioadhesive materials: a review. Biomaterials 1996;17:1553-61. Kumer P. Singh S. Mishra B. Development and biopharmaceutical evaluation of extended release formulation of tramadol hydrochloride based on osmotic technology. Acta Pharm. Original Research Paper 2009; 59:15–30. Shangraw R.F. and Demarest D.A. A Survey of Current Industrial Practices in the Formulation and Manufacture of Tablets and Capsules. Technol 1993;17:32. Compressed Tablets by Direct Compression. Pharmaceutical Dosage Forms: Tablets, Lieberman H.A. Lachman L and Schwartz J.B. Eds 1989; 2:219. Uddin MD, Uddin MR, Alam MR, Or Rashid MM, Reyad MH: In vitro release kinetics study of Tramadol HCl Sustained Release Matrix Tablet from HPMC K15M. Int J Pharm Sci Res. 3(12); 4975-4981. Gendle R. Kaushik B. Verma S. Patel R. Singh S.K. Namdeo K.P. Formulation and evaluation of sustained release matrix tablet of Tramadol HCl. International Journal of ChemTech Research 2010; 2:4-10. Rao R. Sagar G. Tarun P. Formulation and evaluation of sustained release matrix tablet of Tramadol HCl. International Journal of Pharmacy and Pharmaceutical Sciences 2009;1: 10-15. Sandip B. Tiwari, T. Murthy K. Pai M R. Pavak R. Chowdhary M P. Controlled Release Formulation of Tramadol Hydrochloride Using Hydro-philic and Hydrophobic Matrix System AAPS Pharm Sci Tech 2003; 4:31. United States Pharmacopoeia 29th Edition 2006; NF 24.